A delicate blend of Kalamata olives, capers, garlic and extra virgin olive oil. An authentic Greek recipe, ideal as an appetiser, dip or spread. Storage: Refrigerate after opening and consume within 3 days. Dietary Information: Suitable for vegetarians and vegans. Gluten and wheat free. Egg free. Nut free. Lactose free. 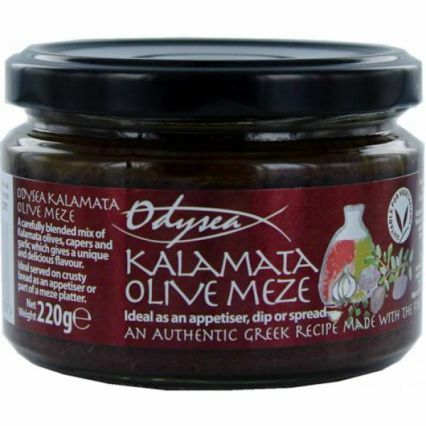 Kalamata Olives (94%), Capers (3%), Red Wine Vinegar, Garlic (0.5%), Extra Virgin Olive Oil. Delicious scraped over some toasted artisan loaf with a drizzle of olive oil and rub some garlic into the bread!